It’s wedding time, which means it’s time for you to start searching for that perfect limousine for your special day. Here are 5 important tips on how to successfully find and reserve your dream limo for your wedding! Follow these guidelines and you should be in for a day filled with luxurious limousine transportation for your entire party. 1. Make sure you know your numbers! How many people are in your party? How long do you need limo services for? What dates do you need the limos? These are crucial questions that you absolutely must address in order to make sure there’s room for everyone and so that the limousine provider has you booked for the proper dates and times. 2. Decide on vehicle types and colors. After you know how many people you need to accommodate, then you can choose the vehicles types and their colors. Do you want a stretch SUV limo or stretch town car limos? Black, white or pink exterior? Make sure to tell the limousine operator your desired specifications before you finalize the reservation. 3. Make your limo reservation far in advance. With your dream limousine in mind, don’t forget that the earlier you act the better the chances are that you’ll be happy. Make sure you line up transportation for your wedding many months in advance to avoid problems such as limo service unavailability. The earlier you decide to book, the better your limo will look. 4. Do research about the limo company. With all the new websites offering customer ratings and feedback such as Facebook, Twitter, and Yelp, you have a vast array of tools available to research what other people are saying about your prospective limousine company. Often, it’s easy to avoid bad companies by discovering negative reviews online and steering clear. 5. Set a reasonable budget aside. Limousines aren’t cheap. Depending on the type of limos and passenger count, you can figure out your vehicle options and approximate your costs ahead of time. Make sure that you begin saving early for your wedding limo budget. This will help avoid complications in reserving and paying for your limo service. Well, that should do it. 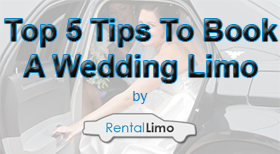 Follow these 5 tips and you should be riding in style on your wedding day. If you still need to reserve a wedding limo, Rental Limo would love to help. Feel free to call us at (800) LIMO-576 or check out our website at www.rentalimo.com for pricing and availability.